JH District Track Meet on March 30th. Boys 800 Meter Relay-Nick Crowder, Silas Lara, Trevor Evans, and Jaxson Diggs placed 4th. Girls 400 Meter Relay- Paris Guerrero, Faryn Crossley, Serinity Frausto, and Avery Donham placed 3rd. Girls 800 Meter Relay- Destiny Suarez, Adalee Donham, Faryn Crossley, and Serinity Frausto placed 3rd. Girls 1600 Meter Relay- Emily Sikes, Destiny Suarez, Madison Fields, and Ella Crowder placed 5th. 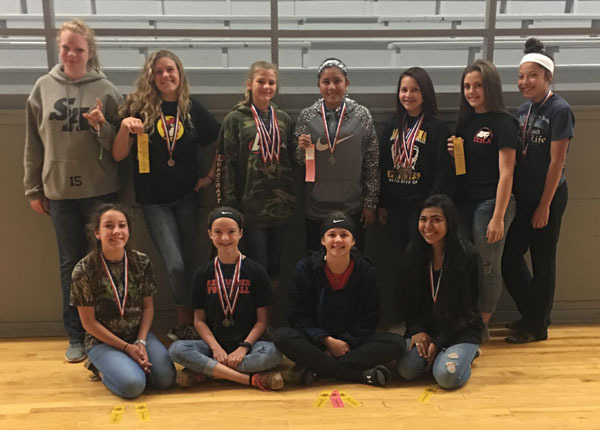 On March 23, the Santa Anna one act play cast and crew took the stage in Eula to compete at the bi-district competition against five other schools. After an outstanding performance, Santa Anna was named alternate to the area contest with Cross Plains, Aspermont, and Eula advancing. Other schools performing were Rotan and Trent. Congratulations to the Santa Anna cast and crew on a terrific season of one act play. Santa Anna High School Track team Participates in the Blackwell Hornet Relays 3/24/17. Results from the Blackwell Track meet. 6th Ashley Beauchamp Santa Anna Flight 1 90’-8"
Congratulations and thank you for continuing the tradition of excellence in Santa Anna. Santa Anna Mountaineer Track team Participated in Piper Relays in Hamlin TX, on March 18, 2017. These girls all competed well and are improving their individual events each meet. These Young men competed well and improve each meet on individual and team events. 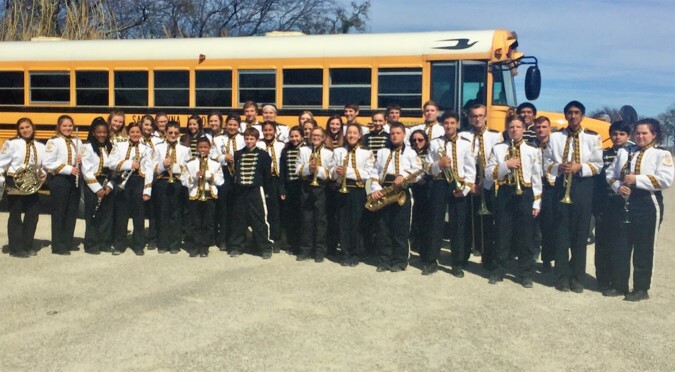 On Thursday, March 2, The Santa Anna Mountaineer Band traveled to Hamilton ISD to participate in the annual UIL Concert & Sightreading Contest. This is the first time in several years the band has participated in this particular contest. The band has been working on 3 pieces of music for the contest since returning from Christmas Break. The pieces included Copper Creek March by John Edmonson, Majestica by Gary Gazlay, and Courtlandt County Festival by William Owens. The band received a 2-2-2 (excellent) for their performance of the three pieces. The ratings go from 1 (superior), 2 (excellent), 3 (average), 4 (below average), 5 (poor). The band’s performance was rated EXCELLENT!!!! The next portion of the contest involved Sightreading a piece of music that the group had never seen before. The Mountaineers received a 1-2-2 for their performance of the piece. For most of the students, this was their first opportunity to participate in Sightreading. The students did an amazing job this year at Concert and Sightreading! The students involved in the contest were as follows: Delaynee Absher, Ashley Beauchamp, Angie Calfa, Tony Calfa, Lily Carter, Katelynne Craig, Ella Crowder, Madison Diaz, Luke Dotson, Chris Ely, Domanic Enriquez, Kellen Evans, Madison Fields, Trace Garrett, Daniel Garza, Noah Garza, Lisamarie Gomez, Kloey Guerrero, Paris Guerrero, Taylor Guerrero, Marin Guthrie, Hunter Hammond, Jaylie Jones, Mateo Lara, Silas Lara, Dwayne Mattes, Chase McIver, Breanna Michon, Madalyn Perez, Sudie Puckett, Trystan Rice, Cody Robertson, Jake Smiley, Alexis Washington, Mia Whaley, Madison Wise, and Makayla Wise. A big thank you to Eddie Alonzo and Jackie Sowell for their help in getting the kids to contest that day!! 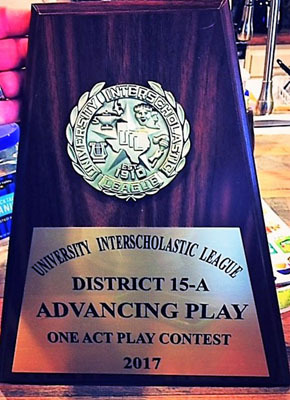 The Santa Anna Secondary one act play cast and crew recently attended district competition at Eula. 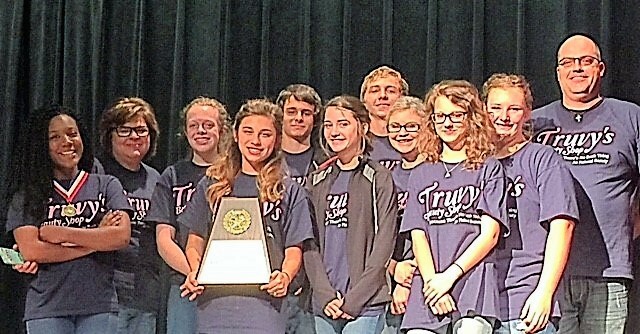 The group competed against five additional schools with three selected to advance to bi-district. 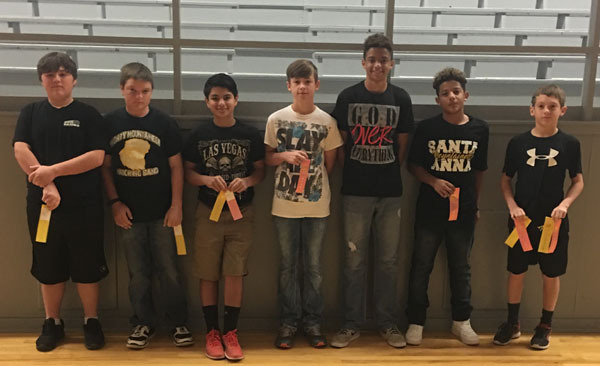 Santa Anna was selected to represent district 15 at the bi-district competition on March 23, 2017 in Eula. 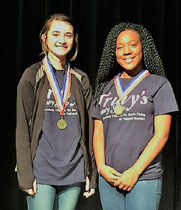 In addition, three cast members were given individual awards: Sudie Puckett and Mía Whaley received All Star Cast medals and Breanna Michon was given an Honorable Mention All Star Cast award. Rylee Hammond was chosen as part of the All Star Crew. Additional schools advancing are Cross Plains and Eula. Pictured from left to right: Mía Whaley, Director Jackie Sowell, Jaymee Corns, Madison Diaz, Hunter Hammond, Sudie Puckett, Trace Garrett, Breanna Michon, Rylee Hammond, Ashley Beauchamp, and Assistant Director Matthew Sowell. Wynell Hipp age 84 of Santa Anna, Texas passed from this life on Wednesday, March 8, 2017 at 4:00 pm at Holiday Hill Nursing Home in Coleman. Services will be Saturday at 3:00 pm at the Santa Anna Cemetery Pavilion with Rev. David Williams officiating. Interment will follow at Santa Anna Cemetery with services under the direction of Henderson Funeral Home of Santa Anna. 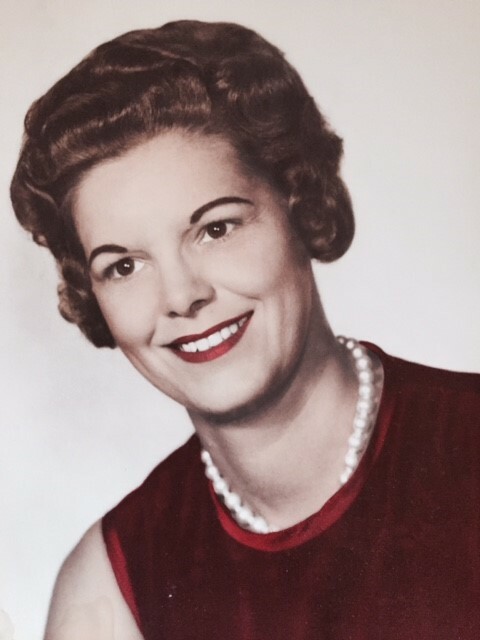 She was born Effie Wynell Wristen on October 8, 1932 in Santa Anna, Texas to Daniel Franklin and Ollie Lee Kelley Wristen. Nell was raised in Santa Anna where she attended the Santa Anna Schools. On December 28, 1949 she married James Clifton Hipp in Brownwood, Texas and they celebrated forty four years of marriage. James preceded her in death in 1993. James and Nell lived in Odessa and Clyde until returning to Santa Anna in 1993. Nell was a member of the First Baptist Church of Santa Anna and was a homemaker. Robert Robinett age 91 of Santa Anna, Texas passed from this life on Monday, March 6, 2017 at the Coleman County Medical Center. Services will be Wednesday at 2:00 pm at Northside Baptist Church with Rev. Marvin Hale and Rev. Gary Lawrence officiating. Interment will follow at the Santa Anna Cemetery with services under the direction of Henderson Funeral Home of Santa Anna. The family will receive friends from 6:00 till 8:00 pm at Henderson Funeral Home. He was born Robert Dallas Robinett on May 5, 1925 in Coleman County, Texas to Dallas and Bera Ferguson Robinett. Robert was raised in Coleman County where he attended the Hardin Elementary and Mozelle High School. On December 5, 1942 he married Maggie Cope and they celebrated seventy three years of marriage. Maggie preceded him in death on March 13, 2016. Robert was a lifetime resident of Santa Anna where he was a member and Deacon of Northside Baptist Church and member of the Santa Anna Volunteer Fire Department. He was a dairy farmer and a dozer operator for the Santa Anna Silica Sand Company. Robert and Maggie owned and operated Robinett's Garage until his retirement. 18 Great Grandchildren – Chrystal & husband Tyler Morgan, Jennifer and husband Josh Rambo, Jessica and husband Chris Cheaney, Walker, Hadlee and Hudson Pierce, Addyson and Bethany Findley, Karly Ryan and Brenden Dallas Bartholomew, Clayton Hunter, Chase and Ellie McIver, Cason and Mylee Guthrie, Spurr, Jayda and Skylar Farley.